Stuff can remind us of things we would not otherwise remember. Photo: Lone 2013. There is only so much you can fit into the luggage limit of airline carriers. When you are packing your bags for a year-long sabbatical in Denmark you have to make harsh choices. Luckily we’ve secured a furnished apartment just outside the lakes in Copenhagen. This does reduce the amount of stuff we need to bring or acquire. For years we have been trying to get rid of stuff – to declutter our lives. Somehow stuff just seems to accumulate and fill every surface, like dust whirling up in the swoosh of movement or encouraged by south easterly winds – and settling in the corners and on the skirtingboards until it is disturbed again. I find that I hang on to stuff because it has a meaning for me. It may be a present given to me by someone I love. It may be something someone was made especially for me. Or it may be something useful one of us bought. The best stuff is stuff that is designed well and used often. These are the objects that last and also bring lasting memories. Farmor in the house in Solbakken. Photo: Lars 2014. Each time I sit in one of the Børge Mogensen Spanish Chairs I am thankful that these beautiful chairs ended up in our house in Brisbane. My parents bought these chairs in the 1970s when we moved to Gjellerup. They sat in the tiled lounge room in the middle of the brand new house, together with the clunky, soft and deep modular couch. 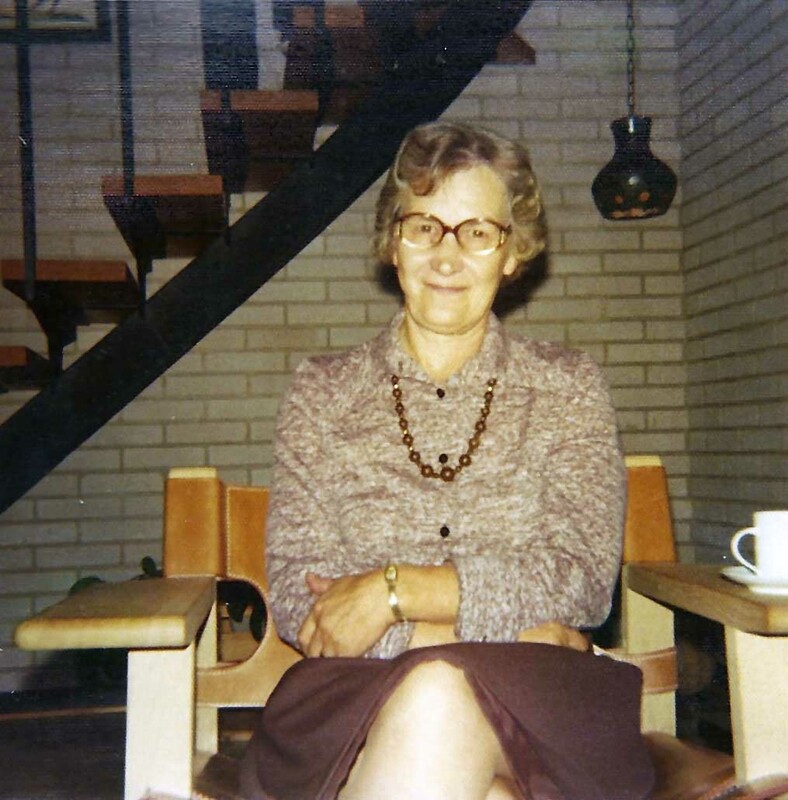 Like a casual prop in photos of my grandmother comfortably sitting at a family party. When we moved to the next house in Gjellerup on top of the hill, the chairs were incorporated into the combined kitchen and tv room – much more frequently used, but less elegant because they could not sit side by side in the space. Finally in my father’s last house in Herning they sat in the corner of the swimming pool room together with the buffalo leather couches, inviting one to perch a cup of coffee on the wide arm rests and pick up a book from the overflowing coffee table while listening to music blaring from the Bang&Olufsen sound system installed to fill the large room. This corner has stuff to remember by. Photo: Lone 2014. Now, in the early hours of the morning, the chairs let me catch the weak rays of morning sun before they gain power and blaze onto the solar panels on the roof. 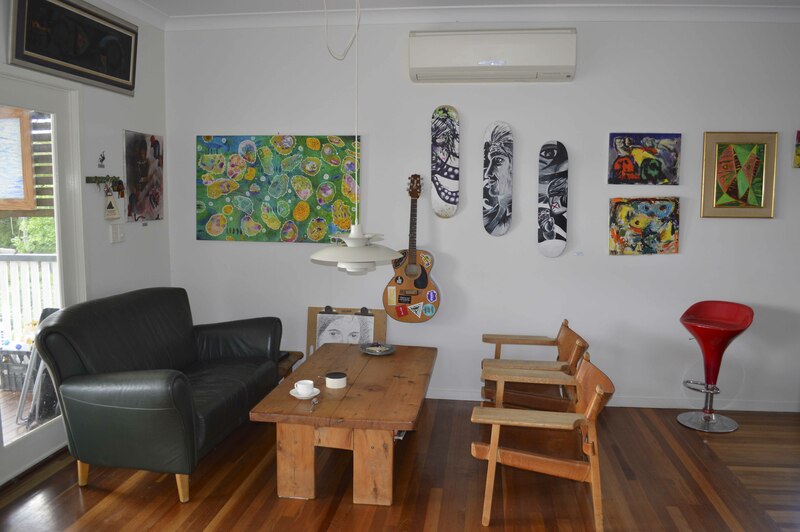 The chairs sit with the cedar coffee table that Mick created from the beams left-over when we built the house on the hill in Bunya in the early 2000s. Inspired by a large, rustic coffee table from my childhood home, it is a robust table that is both functional and beautiful. On the other side of the table is one of the green Natussi leather couches we bought, one at a time, as a present from my parents when our boys were born. Those couches have been tough enough for babies, toddlers and teenagers, finally giving in to the direct sunlight on the deck, causing the leather to crack. Over the table hangs a PH lamp – the classic lamp that was a wedding present from my parents’ business partners. It was second hand then, surplus to requirements, when they decorated the ground floor flat of the home that also housed the publishing business and my family. On the table sits a small dish that Mick wove out of tie wire during his first year of the fine arts degree. It accumulates stuff: ear phones, coins, a card. On the wall hangs Mick’s Takemine guitar, so often picked up by our younger son to strum a few chords or pick a few Spanish notes. It hangs next to a painting by artist Joanna Underhill, ‘Cellular Intelligence’. Following a bout of cancer, she studied cancer cells during a residence at the Brain Institute. The result is a series of work that explores the structure of cells which provides inspiration for quite intricate imagery and colour. I fondly remember the story behind this work when I look at the green and pink scratches on the first board. Photo: Lone 2014. On the other side hangs a piece my older son did in Year 12 Visual Art, ‘Waiting for skating’. 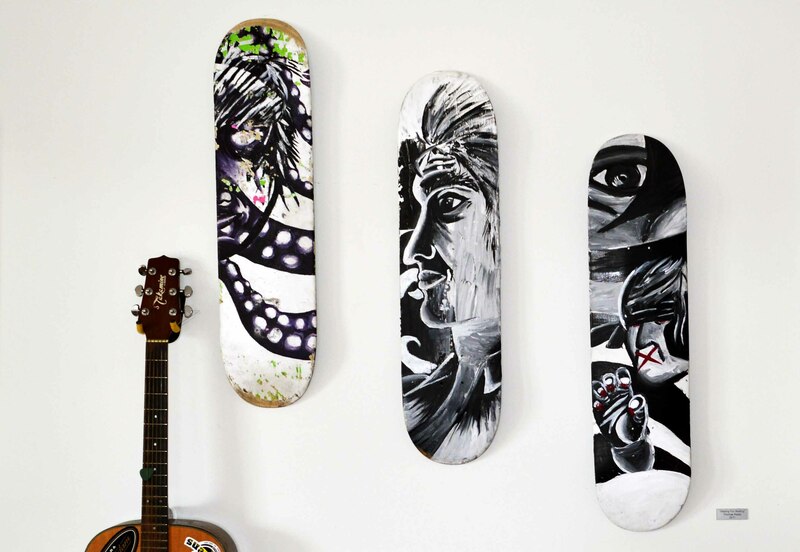 Three skate boards form the canvas and three faces in various states of patience adorn them. Clearly, my son is not particularly patient. One day he screwed the wheels back on to one of the boards: he wanted to skate. When I realised, I promptly bought him a fresh board and the piece was restored to the wall. He promised to touch up the scratched board. However, in the intervening period I have grown quite fond of the authenticity of the green and pink paint that shines through and the edges that are worn down to the timber core of the board. Besides, it is a good story. None of this stuff will fit in my suitcase. And this is part of the point. These objects are integral to the life world I have created in Brisbane with my family. This life is part of me, but only one part. With the chairs and the lamp – and many other objects – I have integrated my Danishness into my Australianness in physical manifestations. I have invented a self that combines my experiences, language and memories. One reason for going back is to refresh and reconnect with the Danish part. Together we will find new inspiration and create new memories for the next period of our lives, which integrates more of my Danish heritage. My self is indivisible and when we are away, there will no doubt be things that I miss from this sunny part of the world. Stuff that I have grown used to. This entry was posted in Memory and tagged art, Australia, Børge Mogensen, Brisbane, Bunya, Copenhagen, Denmark, Gjellerup, Herning, interior deisgn, Joanna Underhill, Memory, Queensland, sabbatical on December 7, 2014 by lonebonekaffekone.